In the couple of months since CTS first visited the White Elephant (561 Barkly Street) in West Footscray, its situation has grown and evolved. 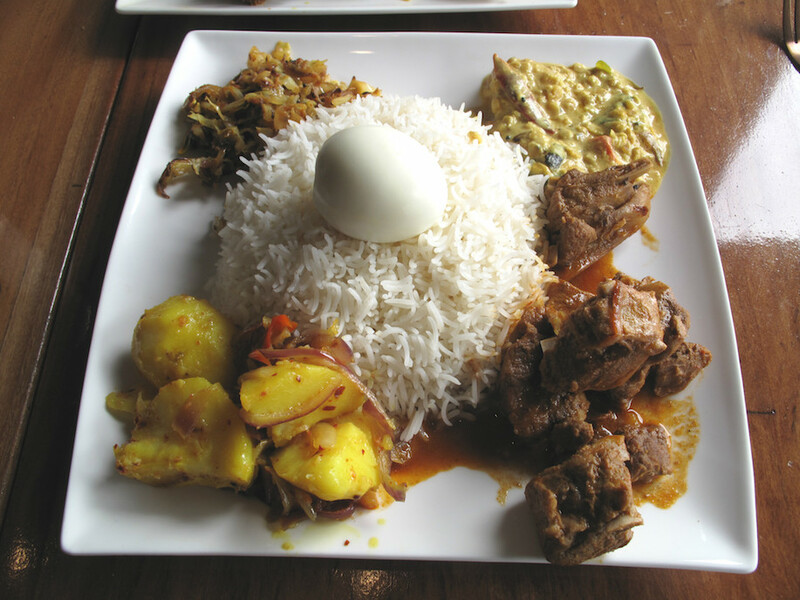 The Sri Lankan place has earned – and is earning – well-deserved plaudits for the quality of its food. It was not always apparent this would be the case, surrounded as it is by so many Indian eateries. Different food, different countries, you bet, but I wasn’t sure those differences would be sufficient for White Elephant to establish a foothold in a very competitive area. As, well – the prices have gone up. On the occasion of our earlier visit, the three members of that night’s Team CTS appreciated the ultra-low prices, but surmised they were simply unsustainable in the longer term. Rice and three curry bowls (two veg, one meat) for $15? My lampraise then cost $17 and now costs $24 – and given the quality of the food, that is STILL affordable, well within cheap eats territory and very fair. So, yes, we’re happy about the higher prices as hopefully they mean White Elephant will be around for many years to come. But as Julian, Nat, Bennie and myself discover when we convene for a Sunday Sri Lankan lunch, it remains possible to eat here for next to nothing, albeit on a restricted menu – with which we have no problem at all. A good on-the-bone lamb curry. Though the strong fishiness of the cabbage curry – derived from dried Maldive fish – is way less agreeable to me than my companions. Our meal takes an hour to arrive. Which brings up another point about White Elephant. Some online sleuthing will quickly turn up comments and reviews in which the serve-time factor here is mentioned – sometimes quite stroppily. Here’s the thing, though – this leisurely pace is obviously part-and-parcel of the place and its people. There’s a lot of care going into the food. If this is an issue for you, or if you’re in anything that even remotely approaches a hurry, then you’re in the wrong place. Just for the record, I’ll mention the two dishes we have been served on a complementary basis. The beef pan rolls are crisp, fresh, spicy, packed with beef ‘n’ spud and as good as any of us have had of this popular SL snack fare. 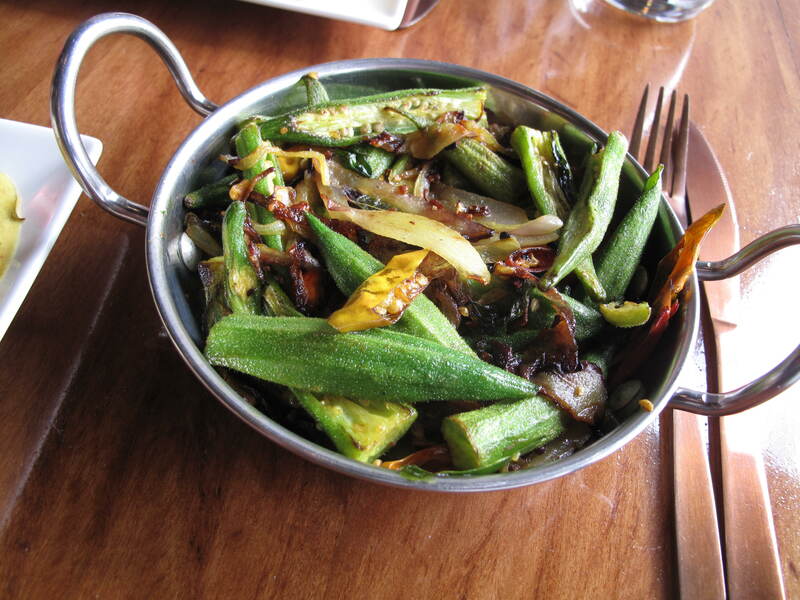 As on our previous visit, the dry okra curry is fabulous. We’re unsure whether or not these dishes have been provided to us because of the wait time (in the first case) or, in the second, because we’d mentioned it when ordering. Likewise, we know not if this sort of generosity is standard practice or if we’ve received special treatment. Either way, we are grateful! I think your review is fair and balanced. I’ve been there quite a few times now and I find the food consistently fresh (hence the wait as some dishes are cooked from scratch . Sonali the chef/ owner cooked a couple of dishes specially for my wife who can’t eat onions which is an essential ingredient in all SL curries). I find the style of cooking here is less oily, lighter and in my opinion also a lot tastier than a number of other Sri Lankan restaurants I’ve tried including those in Sri Lanka. Thanks for the feedback, Ray! I’ve noted your enthusiasm on FB for the place. Your hearty thumbs up overall says a lot of good things about the place. As addressed above, I had fears for them – so I’m really happy they’re making a good go of it. We had lunch at the White Elephant the other day. Whilst the wait staff really did want to be somewhere else the food was fabulous. 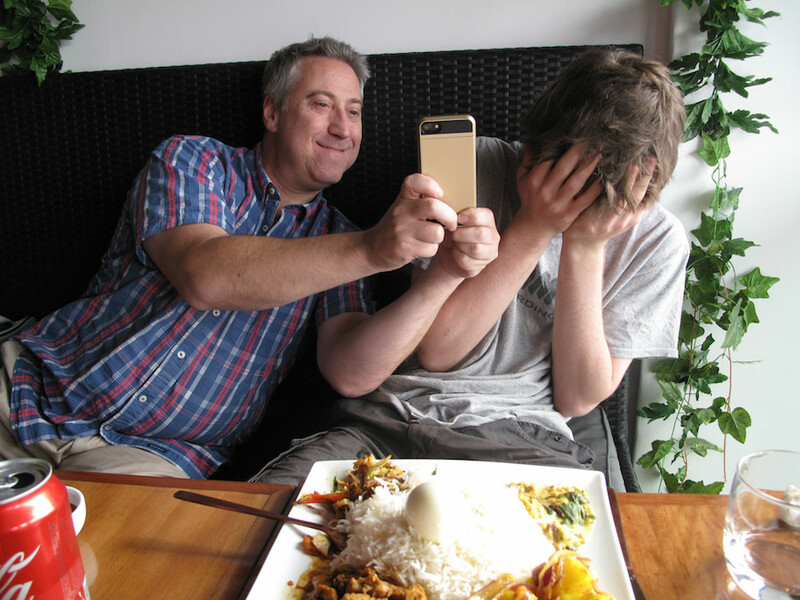 We ordered a goat curry which was wonderfully peppery, a dahl and the eggplant curry. One serve of rice and one of roti was enough for three of us to share.